The Pennsylvania Association of Career & Technical Administrators (PACTA) has been a valuable partner with EPLC for the past seventeen years. PACTA currently is a key partner with EPLC and other organizations working together on EPLC’s Career and Technical Education Project. For several years, PACTA also was a major partner with EPLC in the Pennsylvania School Funding Campaign. PACTA has frequently provided a forum for EPLC to report or discuss key education issues, has generously provided financial support for EPLC programs, and has frequently provided presenters for EPLC policy forums, finance symposiums, and leadership programs throughout the past seventeen years. PACTA strives to promote excellence in career and technical education through leadership, advocacy and service. PACTA supports the belief that career and technical education is an integral part of the Pennsylvania system of economic and workforce development and of the state public education system which serves secondary students as well as adults. It supports the idea that career and technical education must serve the needs of business and industry by delivering programs which meet national skill standards and offer recognized credentials. All citizens should have the right to quality, affordable and accessible career and technical education. 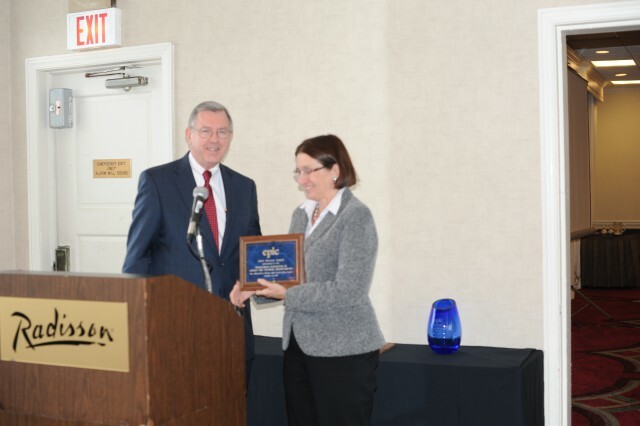 PACTA Executive Director Jackie Cullen received EPLC’s 2015 Partner Award from EPLC President Ron Cowell. The Center for Schools and Communities has been a major contributor to EPLC’s policy forums, leadership programs, and special events for many years. Several staff members of the Center have completed EPLC’s Pennsylvania Education Policy Leadership Program, and the Center’s Executive Director, Lynn Cromley, was recognized with EPLC’s Leadership Program Alumni Award several years ago. EPLC has previously served on an advisory committee for the Center’s Parent Leadership Initiative, and most recently has cooperated with the Center to provide advocacy training for the Afterschool Ambassador Program. Since 1988, the Center has been committed to improving outcomes for children and families through training, technical assistance, program evaluation, research and resource development. The Center’s work focuses on prevention and intervention initiatives operated by schools, organizations and agencies serving children, youth and families. The Center’s staff members have diverse backgrounds in education, human services, community development and the law, as well as specialized skills and experience in program development and design, evaluation, training and resource development. This combination of education and experience has enables the Center to provide customized technical assistance to support the development of innovative programs in schools and communities. 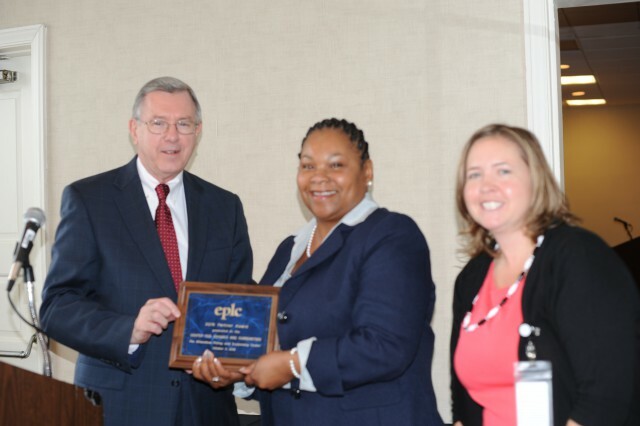 EPLC President Ron Cowell presents EPLC’s 2015 Partner Award to the Center for Schools and Communities, represented by Shileste Overton Morris, Senior Program Development and Organizational Manager and Laura Saccente, Director, Pennsylvania Statewide Afterschool/Youth Development Network. Click here for more on EPLC’s Annual Awards.